Coach Daniel Rasay and players Brenda Salantes and setter Loke Davis have brought an island atmosphere to Mills College in Oakland, Calif.
BABY steps can be painful when crawling hasn't been mastered. Such is the task ahead of former University of Hawaii setter Daniel Rasay, in his third month as the head volleyball coach at Mills College, an all-women's institution in Oakland, Calif. It's tough to build a program almost from scratch, tough to build a team with limited resources ... including a lack of volleyball players. "A lot of our girls don't have that much experience," said Rasay (Konawaena '00), who played for the Warriors from 2002-05. "Our school doesn't focus on athletics that much." At the NCAA Division III level, there are no scholarships. But what the Cyclones lack in money and athletic credentials, they make up for in passion for the sport ... with an island flavor. Sophomore Loke Davis (Hilo '05) has been converted to setter by Rasay, a position she never played in high school. Brenda Salantes (Mililani '04) hadn't played the sport since middle school. Both are hoping to create a strong foundation for volleyball at the school of 881 students best known for its outstanding liberal arts education. "Setting is a real challenge for me but it's fun and really exciting," said Davis, a middle blocker most of her career. "Coach told me before the first practice what he had in mind for me. 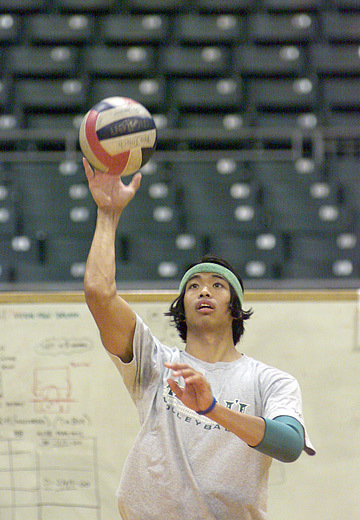 Former Hawaii setter Daniel Rasay was hired as head coach at Mills College just two weeks before the program's first match of the season. "At first I wasn't sure how I felt. But the more I thought about it, I realized it was a real opportunity to be a well-rounded volleyball player. I'm very excited about helping build this program." Success is being measured by more than wins and losses this season for the Cyclones, 1-9 heading into tonight's match at Simpson College (2-9 counting the win over the alumnae). It's about individual player progress as well as that of the team's. It's also about becoming an important part of the campus consciousness. The goal is to regularly fill Haas Pavilion, a facility so small that only one side of the bleachers can be pulled out in order to set up a volleyball court, allowing for about 100 fans. It's so small that Mills cannot field an intercollegiate basketball team; there is no room to extend the basketball court to regulation size. The volleyball team has begun to promote itself, putting up signs on game days, sponsoring theme nights. "My first season, we didn't have a lot of fans," Salantes said. "But we're getting a lot more now. We had a Hawaiian night and people came dressed up. "There are cliques within our little community and it's nice to see people from cross country and soccer come out, or people from my classes. Loke's mom comes and brings ti leafs. It's almost like home." Attending an all-women's college is not for everyone but both Davis and Salantes say they have thrived in the environment. "I had doubts, coming from a big coed public high school," Salantes said. "I thought it would be a difficult transition but the first day of classes I felt so comfortable. "I feel I'm getting the most out of my education and there's so much support for my academic goals (degree in bio-psychology). It's gated, secure, everyone knows each other. It's like being on an island and I would absolutely recommend it to any woman in Hawaii." "We have a cute saying here," said Davis, a communications major. "It's not a girls school without men. It's a women's college without boys. "It's very empowering, like going to school with all your sisters. The volleyball team is like my second family. And the campus is beautiful, so green. Coming from Hilo, that was a big thing. It has a really nice community feeling ... like Hawaii." That's what Rasay hopes will draw other island women to Mills -- women who love volleyball but never thought they could play beyond high school. Or someone like Salantes, who didn't play sports in high school. She transfered to HPU for a semester -- "I didn't even think about trying out for them," she said -- and returned to Mills, continuing to take advantage of an opportunity to play at Division III. "What I see at this level is passion and desire, people who want to play," Rasay said. "It gets frustrating for me. I've never been on a team under .500, and it's a different skill level than I'm used to. "But all I ask is that they come out and play their hardest. My goal is to help develop people through athletics. Sure, I'd like to build a stronger volleyball program, start being more competitive in the conference, but it's about character and learning skills that will make you successful in life." The Cyclones beat William Jessop the second match of the season, their first win in almost two years. "And we've come close a couple of times," Davis said. "It's a nice turnaround from last year, a different feeling. Daniel wants us to play well, win or lose. "The team has become so cohesive, on and off the court. Seriously, this is my family." Tuition at Mills is pricey, about $30,000 a year, with an additional $10,000 for room and board. But, Rasay said, there is a lot of financial aid available and a superb education to be had. "It's one of the top liberal studies colleges in the U.S.," he said. "It's a really beautiful campus and you're not that far from San Francisco. The Bay Area is awesome. "The school is very diverse and everyone is so close because it is small. It was an easy transition for me and for kids from Hawaii, it would be the same." Rasay had hoped for a pro career overseas but an injury put an end to that dream. He began working volleyball camps while applying for coaching jobs on the West Coast. He was hired by Mills two weeks before the first match. "I just want to help student-athletes continue their careers, or even get them started," he said. "I think having a Hawaii tie here will help."